The occasion also marked forestry company UPM’s international ‘Plant A Tree Day’ which has so far involved young people planting trees across the globe including Finland, China, Russia, Uruguay and Spain. 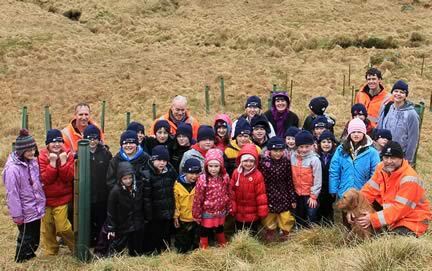 Around 30 children aged four to 11 from Lochgoilhead Primary School helped plant 200 trees including oak, alder and cherry at Carrick – the first of over one million trees which will cover around 760 ha once final approval is received. The Carrick Jubilee Wood is a 200 ha new native wood including species such as oak and alder. 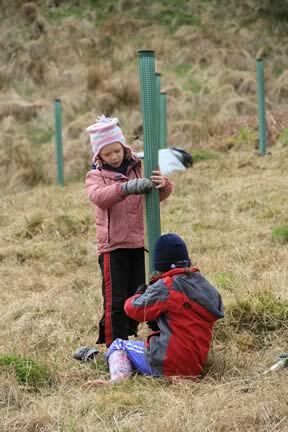 It is being planted alongside a new commercial productive conifer woodland. Planting is planned to take place over the next three years with ‘protected’ wildlife areas being incorporated into the scheme. The site is especially important as it falls within the Loch Lomond and The Trossachs National Park. The woodland is being planted later than most of the other Jubilee schemes around the country because the The Woodland Trust, UPM Tilhill and forest investment fund ‘FIM Sustainable Timber & Energy’ that owns the property are waiting for final approval from Forestry Commission Scotland following a detailed Environmental Impact Assessment. As well as the fact that the area being planted is in a National Park, the planting scheme had to take into account the use of the site by golden eagles. Low-density woodland has been incorporated specifically to encourage wildlife. Carrick Farm forms an important part of a golden eagle home range. The resident eagle pair produced a chick in 2011 and 2012, neither of which survived. Starvation is likely to have been a key factor, with results from ground surveys by UPM Tilhill ecologists suggesting a lack of wildlife on the property. They believe that the Carrick eagles are currently sitting on eggs at the moment and are crossing their fingers for a successful breeding year. “It’s great that as well as contributing to our Jubilee Woods Project, the children from Lochgoilhead could become involved in the international Plant a Tree Day. The six million trees planted as part of the Jubilee Woods Project have resulted in the creation of hundreds of new woods across the UK totalling 5,000 hectares or 12,355 acres, the equivalent tree cover of three times the size of all the Royal Parks in London. This includes 3,770 ha in new woods and 1,237 ha through the thousands of free Community Tree Packs distributed by the Woodland Trust to schools, councils and communities across the country. Given that the total planting figure for the entire UK in 2012 was 12,000 ha, this is a huge achievement for the Woodland Trust, demonstrating the charity’s commitment to increasing native woodland cover. Not only has the Trust planted 6 million trees, but millions of people, communities, schools, and landowners have been inspired to take part in the project. The investment fund that owns Carrick Jubilee Wood is managed by specialist forestry investment managers FIM. FIM currently manage in excess of 53,000 ha and in 2012 another planting scheme also managed by FIM and UPM Tilhill won an award for new commercial woodlands. UPM is participating in Environment Online’s Tree Planting Day which is an annual event and part of UPM’s partnership with ENO - a global virtual school and network for sustainable development. In 11 years of operations, ENO has reached thousands of schools in 150 countries. The seedlings planted on the Tree Planting Day represent just a fraction of the 50 million seedlings UPM plants annually. The co-operation with ENO and local schools is extremely important in building future generations’ relationship to nature and forests. Tree planting is a concrete way of bringing forest-related topics closer to people. It is one way to demonstrate how UPM continuously plans actions related to forestry and forest regeneration in the long term. UPM is committed to its international biodiversity programme. The goa l is to secure biodiversity as a vital part of sustainable forestry, and simultaneously promoting best forestry practices. The United Nations’ biodiversity declaration signed by UPM is a natural part of the company’s long-lasting work in developing sustainable forestry practices.